I have been using the magnets since I was six years old. Any ache, my father would adjust me and then put the magnet. All the water I drank, and still do was magnetized, or polarized. “The power that made the body heals the body,” Chiropractic and Biomagnetic principle, too. So I grew up, only doing what my father taught me. In 1984, I became a Chiropractor and began my practice in 1985. When I started practicing, I had all the equipment from my father, all the contacts to buy the flexible magnets and prepare them for my patients. I had the training, since his lab was in my house I used to spend hours with him, helping him prepare the magnetic bands, and learning. I remember his research on cancer; he showed me the difference of the blood cells under the microscope, healthy vs. cancer sick. But I thought, I am not prepared yet to continue his research, maybe when I am older. I did, though, for 26 years continued his mode of practicing, gave my chiropractic adjustment and offered magnetic therapy or magnets to the patients, friends and of course, my family. Dr. Jorge C. Jarrot, as I said, my husband and chiropractor, has been a wonderful help in the magnetic field. He had studied electrical engineer before, so he helped me, along with my mother, Irma, prepare the magnets for the patients to take home. Health Magnetic Store was established since 1985, but only to my patients, friends and those that were referred. At the same time, years after Sierra passed away, Taiwan, China, Japan, Canada, Australia, Europe and United States manufactured magnetic products, most of which are with Dr. Sierra’s specification, north (-) to the skin. I say most because: We have been buying and researching these products for nearly 30 years, using them in ourselves and our patients. By doing this research we found that the commerce of magnetic products has grown worldwide, sadly must say, and because most of the magnetic products made, that are easily available to the general public, are missing the therapeutic potential needed to make a change. We worry. Dr. Jarrot and I carefully evaluate the magnetic strength, polarity and designs. So we decided we could not wait any longer, it was time. On the other hand, so many persons including health care practitioners asked us: “Who better than both of you?”; (myself, for over half my lifetime of experience, receiving and providing), can help more people achieve similar results with the proper use of the magnets, by education not only to the public but health care providers, on the appropriate use of magnets, show the world what Dr. Sierra left, finished and unfinished, his research, a photo album, etc., and re-start what he left, do what others are doing using expert voices, but, different from them. We have the source of one of the persons that helped this science be known. In my search, I also came across other patents and found many of health magnetic products, some good, and similar to what my father designed in the 1970’s with the flexible magnets, that he did not get a chance to patent. I also found that there have been few new discoveries, and most of them based on the concepts of Sierra, Davis and Rawls. When you read their books, they all ask us to do research and repeat the experiments that they made, and to consider it as an alternative health care. But I don’t see that they get much credit. They were criticized then, now they were ahead of time. This confirms that from the United States, these were the true scientists and the real experts, and we, Jarrot and Sierra, like the others, are following what they, our teachers, taught us. And yes indeed, we are also experts in the field, but only because we dared to repeat and confirm their experiments, not because we discovered something new. This is our evidence of the wonderful acceptance it is receiving. No matter how long it took us to get this message across, these past 8 years, as Health Magnetic Store, (we have we have been online since 2004), but providing magnetic therapy nearly 30 years with a nearly 50 yers experience in this healing method. Our children will continue their grandfather’s, mother’s and father’s steps. The eldest of the three (3) is already a Chiropractic Physician. 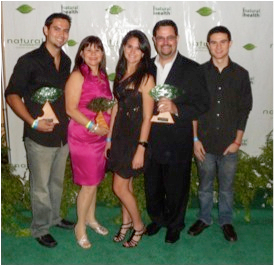 Dr. Jorge R. Jarrot Sierra, the younger two, Adrian and Alexandra are currently in Chiropractic school. Our purpose in HMS, since we know that many persons can benefit from this health alternative, is to help you use Bio-magnetic correctly, as complementary therapy or by itself, for neuro-muscular-skeletal conditions and many others, in order to help your body increase energy, while enhancing wellness. Remember: Keep a supply on hand for first-aid use.